I would like to try on this page to take stock of what is possible to know in the case of the crash of Flight 17 MH, in the absence of the report of the experts that the US authorities refuse to publish, and using open sources that are available to the public. The use of resources is particularly difficult because the vast majority of published documents are forgeries, fakes and that the honest seeker loses a lot of time analyzing documents to verify their authenticity, work that proves most of the time unsuccessful. Photos, videos, voice recordings, messages on twitter, circulating on the networks are almost all false, fabricated documents from scratch, or dealing with any other question, and totally out of context. There are for example two YouTube videos purporting to show the fall of Boeing and which one is actually the video of the fall of a spy plane, which has nothing to do with Boeing and the other comes from Afghanistan. I therefore give a version of events that are based only on evidence and compelling arguments, and by no one contradicted. 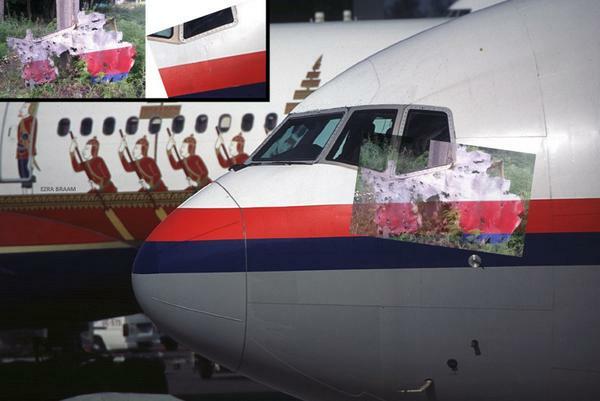 Who shot down Flight 17 MH? To this question there are two answers: the Ukrainian government, NATO countries and the vast majority of Western media outlets say in unison, while admitting they have no conclusive evidence, that it would have been shot by a ballistic missile type 9M317 fired from a Russian-made system BUK. The Russian government, meanwhile, says he was shot by a Ukrainian 25 Soviet-made fighter type SU. This thesis immediately spread around the world, and is often the only considered by the media, but it is actually almost impossible to support, mainly for technical reasons. Advocates of this view recognize that there is no absolute proof, but as they refuse to consider the other argument, they obviously keen to that. Now it is completely unlikely that a Boeing may have been shot by a BUK system using a ballistic missile without much evidence and a lot of proofs. A 9M317 type of ballistic missile is equipped with a rocket, and propelled to a speed greater than 3000 km / h, which allows it to reach a target located 10 000 m in 12 seconds. 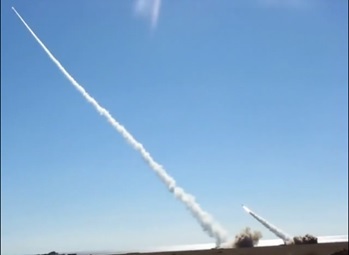 This rocket leaves a white trail that extends from the firing point to the point of impact, which is perfectly visible from several kilometers away, and, on clear days and in the absence of wind, takes more than five minutes to dissipate. In this densely populated area, it would have been seen by hundreds of thousands people. But there is not a single eyewitness, not a single photo, not a single video that reports the presence in the sky of such a drag. The missile in question not only draws shrapnels, beads or metal rods as an air-to-air missile, but it is especially equipped with a 150 lbs. explosive charge which explodes when it is 20 m below the plane, causing a shock wave that breaks the fuel tanks, causing them to blast, and breaks the plane in the middle. The ensuing fireball is clearly visible from the ground, and the trace in the sky can take up to 10 minutes to dissipate. Or, again, no one has seen anything, and there is no photograph of such an explosion. On the other hand, there is a genuine video, taken on his cell by a person living near the site of the crash, showing flames and thick black smoke that rise above the wreckage of the plane, and demonstrate, as well as the aerial view of this, that the fuel tanks were still full when the main body of the aircraft crashed to the ground (the cockpit having fallen at a considerable distance). That those tanks were kept full until the aircraft crashed to the ground is totally incompatible with the firing of a missile 9M317, which would have disintegrated them; with this type of missiles, only a few pieces would have reached the ground. The bi-explosible fuel tank has not yet been invented. "One would make me believe that, after the disintegration of the head" Bukovkaja ", a missile head that weight 70 kg, a plane can continue to flight and produce altitude reduction maneuvers, then go smash in pieces that fall within the radius of a few kilometers of each other. All this is physically impossible. What is disintegration? It is the complete or partial rupture of the plane into small fragments, after which the remaining large fragments falling into uncontrollable rotation and after a brief period of time are completely destroyed due to contact with the ground. There is no aircraft hit by heavy missile system "Buk" to continue flying for some time ... Really no flight. " There was that day in the Ukrainian sky two US aircraft radar type AWACS, which have extremely sophisticated electronic equipments that allow them to not only detect anything that flies in the sky, were it a mere drone, but also allow them to achieve highly accurate photographs of everything that is happening on the ground. However, they found no radar signature that corresponds to this type of missile. Therefore, unless we assume that US detection devices would be so bad that they would be unable to detect what is clearly visible to the naked eye, the simple fact that they did not identify any shooting missiles may be accepted as a proof that there was none. To sum up: no one remarked any missile trace in the sky, no one noticed the slightest trace of explosion of the plane in the sky, the aircraft's fuel tanks have exploded when it reached the ground, no radar has spotted missile launch trace. How can we in such conditions continue to support that this thesis would be defensible? If it were true, we would possess thousands of indisputable evidences. In fact, this second thesis has met only one objection: the airplane, a fairly old model is intended primarily for ground attack, to destroy tanks, but its performance as fighter are quite poor; the opponents of this theory pointed out that his ceiling services, that is to say, its maximum altitude of service is 7000 m, which is insufficient to bring down a Boeing which was located 3,000 m above. This figure is correct, and it is still on the manufacturer's website (http://www.sukhoi.org/eng/planes/military/su25k/lth/) and contrary to some reports, he has not been changed, at least at the date of writing. But the argument is fallacious, he plays on a confusion between the ceiling service, ceiling of the ordinary use of the plane to get the most out of all his performances, and absolut ceiling, the maximum threshold that the aircraft can eventually reach for short periods with reduced performance, which is much higher. For an operation of fifteen minutes, the SU 25 is perfectly capable of exceeding 10 000 m. The only objection that was made against that thesis is therefore not available. The remains of the fuselage bare numerous traces of shrapnel impacts, especially at the height of the cockpit, and these clearly show that they come from a side shot, similar to the traces that would leave the firing of a hunter who would be at its height. A horizontal scratch on the debris of a wing confirms this thesis. This is particularly the dual machine gunning at the cockpit that helps to explain on the one hand that the cockpit was detached from the body of the aircraft to fall to a sufficient distance, and secondly that quantity of bodies and objects have fallen over a large area. 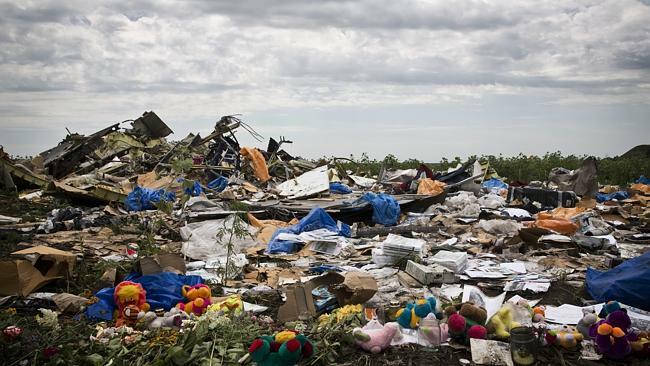 Personal items such as bags, stuffed animals, etc., were found intact on the ground, while an explosion of the aircraft in flight would have carbonized them. 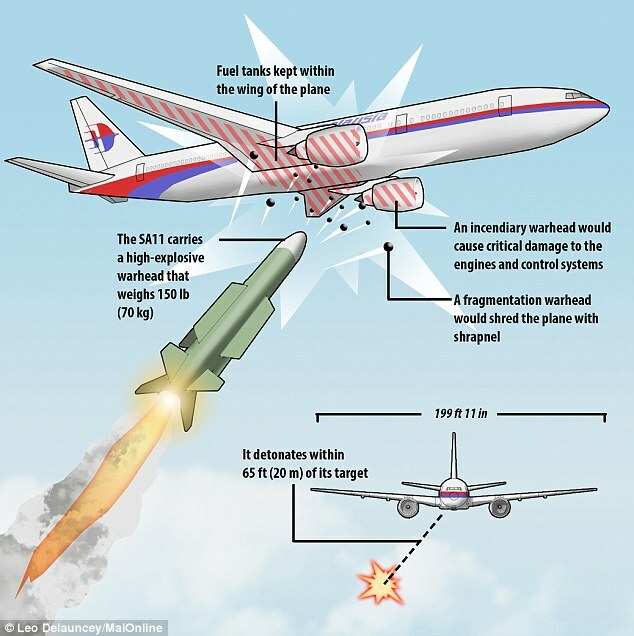 “Damage observed on the forward fuselage and cockpit section of the aircraft appears to indicate that there were impacts from a large number of high-energy objects from outside the aircraft. The pattern of damage observed in the forward fuselage and cockpit section of the aircraft was not consistent with the damage that would be expected from any known failure mode of the aircraft, its engines or systems. 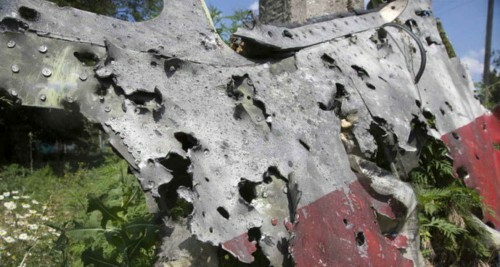 Proponents of the theory of BUK pretend to believe that this paragraph would go in their direction; quite the contrary, if we first take into account the fact that a fighter would leave exactly this kind of evidence, then the fact that there not talking about explosive traces in flight, what should be the case if the plane had been shot down by a surface to air missile. On the other hand, the refusal of the US government to publish the full report is in itself a form of confession; he would hesitate if the report actually comforted his thesis? Both aircraft AWACS radar in the sky that day would have lost track of Boeing, , according to US military authorities, and therefore they are not in a position to present the radar readings. One may wonder once again the very curious and very random functioning of these ultra-sophisticated devices that do not observe anything that is really important. How to explain such a failure, if not by the fact that the radar readings of these aircraft would reveal the presence of Ukrainian fighters at his side? III - Can we give a global scenario that accounts for all the facts? In the days leading up to this event, several Ukrainians aircrafts had been shot by the separatists; it was precisely these SU 25, designed for ground attack and air support for ground troops. To destroy their goals, they were brought down to a relatively low altitudes below 4000 m, where they could actually be destroyed by very short-range missiles. These missiles are handled by two men only, and have a range of about 5 km; they have an infrared guidance. Improvised military can learn to use, unlike BUK requiring an engineer level of education. 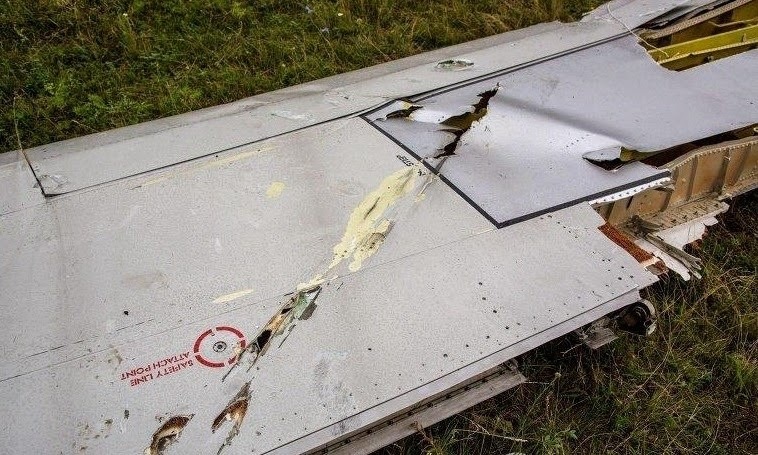 Enraged by the death of their colleagues and their successive defeats, Ukrainian pilots may have decided to avenge by attacking a civilian plane, so as to accuse the separatists, then cause a European military intervention against them. The operation may have been prepared with many complicities because Boeing has not followed that day his usual route passing further to the north; so it was diverted to fly over the area occupied by the separatists; by whom? by hunters themselves? by the control tower? In this case, there is a basic question never asked by the media: who benefits from the crime? It is obvious that there is no benefit for the insurgents; people do not also think of accusing them of having acted voluntarily, but only to have made a mistake. To the contrary, it is clear that the charge against them benefits greatly to the cause of ukrainians nationalists, and that this could be sufficient grounds for them. If it is impossible to accurately measure the impact on public opinion of this charge, but it is certain that it is huge. Would it be as easy for Western governments to support the nationalists in Kiev against insurgents among Western public opinion without this terrible accusation? The US authorities, perfectly knowing the truth, have preferred to hide their informations, not to harm the Kiev government they supported. This presented on the other hand the advantage of permitting them to charge once again Russia. For what can serve to postpone the revelation of truth indefinitely if not to let time to the lie to do his work? This finally allows them to ensure the docility of the Kiev authorities, keeping them under the threat of revealing the truth about the case. It is probably for this reason that the US authorities want to keep secret the expert report, so as to leave it when it will please to them. A striking example of perfectly deliberate distortion of information by journalists may be given by the comment of a journalist from Paris Match, Alfred de Montesquiou, about a video in which two witnesses of the attack of the Boeing deliver their testimonies. He says very clearly that these witnesses would have seen a missile shoot down the Boeing. Then, on the video in question, the first witness did not say anything about a missile BUK, but speaks about another "plane that arrived from behind", "Самолет который заходил" Minute 1: 32, and has bypassed, so he knocked the Boeing on the head, maneuver totally impossible for a BUK, which comes from below and strike directly the fuel tanks. BUK doesn’t make acrobatics. The first witness is not talking about the white trail that the missile should have left in the air, while the second speaks of a "really huge column of smoke" following the plane crash, which proves again that the tanks were intact at the time of the crash. The interpretation by Montesquiou of this interview is obviously perverse: he abuses the fact that the viewer does not understand Russian, and that this expression passes very quickly; nevertheless, it remains perfectly audible. Secondly, regarding the alleged pictures of BUK that would have gone more or less in this place and around this date, it is a smokescreen that proves nothing at all, and that only serves to one thing: make waste time for those who want to understand what really happened (it made me lose a lot). The Russian army has more than 250 of these systems, and the Ukrainian army also has a dozen. These are mobile systems, which have absolutely no need to be carried by trucks. In time of war as now, they normally patrol the borders and are occasionally shooting drills. To see a BUK in this area at this time is almost as common as seeing a police car in Paris; and there is no wonder that from time to time one of them has only two or three missiles into firing position instead of four: it simply means that the militaries had a firing exercise, which is extremely regular. The Ukrainian army itself acknowledged that she had four of these systems operating in July in the region. 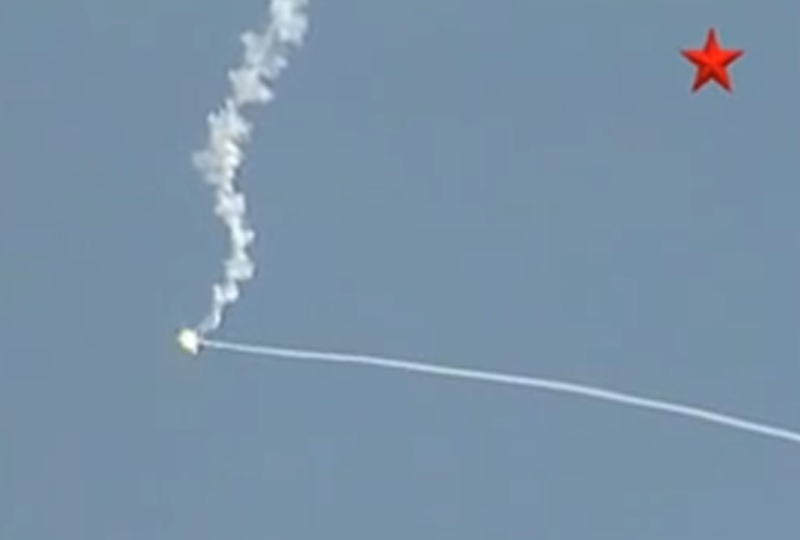 He clearly demonstrates that the MH 17 was shot by two fighters, not a missile.